All mosquitoes progress from egg to larva to pupa and then to an adult. Three of these four stages take place in water. While the mosquito larva is confined to the water, it can be eliminated before it is able to emerge. If a target pest can be treated before it becomes mobile, the area requiring treatment will be much smaller. This makes good environmental sense. 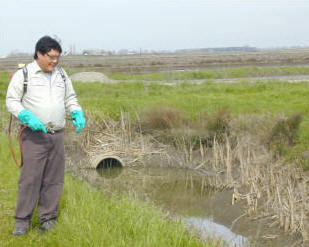 Through the mosquito season, the Sutter-Yuba Mosquito and Vector Control District employs a staff trained to seek out sources of water that are producing mosquito larvae. A variety of control methods can be used. Simply dumping or emptying a container of water, introducing mosquitofish or making a chemical treatment are all effective ways to eliminate mosquito larvae. As technicians assess a site for abatement, the most effective environmentally friendly method will be selected. There are many choices for technicians to consider. Occasionally altering the way a field drains or clearing a ditch full of weeds may eliminate or reduce the problem. If the use of mosquitofish is appropriate, season-long control can often be achieved. Chemical options include some materials that are targeted to affect only a few insect species, leaving predatory and other non-target insect and non-insect aquatic species unharmed. Our technicians identify and treat over 8,000 sources annually. Even a neglected hot tub or small water leak under a house can produce thousands of mosquitoes over a season. You can help reduce bothersome and potentially disease carrying mosquitoes in your neighborhood by checking around your property for stagnant water. Tires, miscellaneous containers and buckets, clogged roof gutters, bird baths, uncovered boats, neglected pools and hot tubs, flooded basements, and anything that can contain water for several days can produce mosquitoes. Here is a comprehensive list of some often overlooked backyard mosquito sources. If you don't think you can take care of the problem, call or (fill out an online service request) for additional help. You can also help by reporting standing water on other property. By eliminating mosquitoes as larvae, before they become biting adults, everyone will have a more enjoyable season.